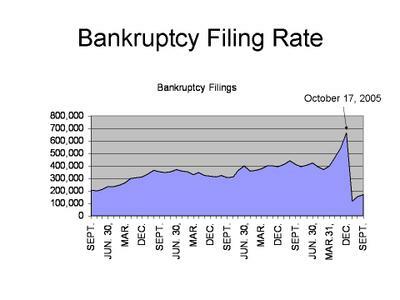 That the consumer bankruptcy filing rate would fall (no big surprise there). That the credit card charge-off rate would fall, but rebound. That consumers' ex ante borrowing decisions would not be altered by restricted availability of the bankruptcy discharge. With regard to the first prediction, it is well known that bankruptcy filings spiked up in advance of the effective date of BAPCPA, and then plunged. According to the Administrative Office of the United States Courts, the number remains depressed, but it has been rebounding -- quickly in the second quarter of 2006 and a little bit more slowly in the third quarter. It is important to recognize that it is still way too early to tell how things will settle in. Bankruptcy lawyers and bankruptcy judges are still adjusting to practice under the new Act. Over time, as practices stabilize in various districts, and lawyers regain an ability to handle cases efficiently, one might expect the filing rate to rebound. In short, we have no idea what the ultimate equilibrium rate of filing will be. More importantly, the bankruptcy filing rate has never been a particularly good measure of the number of families in financial distress. 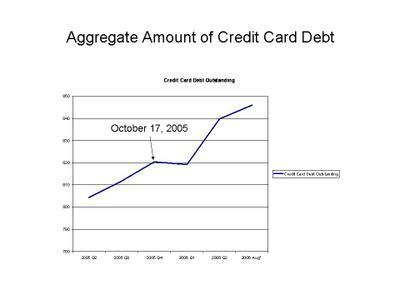 A better indicator of how many families are having difficulty managing their debts is the percentage of credit card debt that is charged off each quarter (the lavender line below). Here, too, BAPCPA has had an effect. 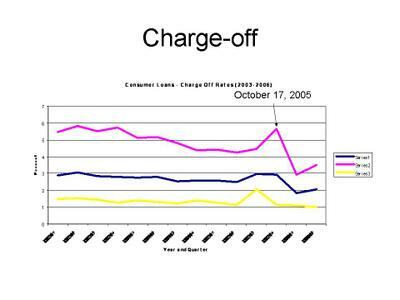 The charge-off rate spiked in anticipation of October 17, 2005 as families that thought they might need bankruptcy filed (and thus charged off debt) in anticipation of the new law's effectiveness. The difference here is that the rebound has been much more pronounced. 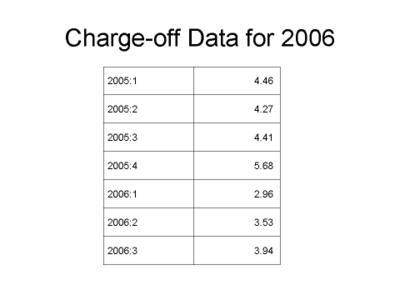 While chargeoffs are not yet back to the level of late 2005, they are getting close. Moreover, delinquency rates are already above where they were in the third quarter of 2005. Again, while we don't know where the new equilibrium will be, there is reason to think that even if the bankruptcy rate remains depressed, the effect on the level of consumer loan default rates will be much smaller. What is most striking, however, and strongly suggestive of our behavioral model for consumer borrowing decisions is that, as far as we can tell, the massive changes in the bankruptcy law in late 2005 have not had any discernible effect on consumers' ex ante borrowing decisions. 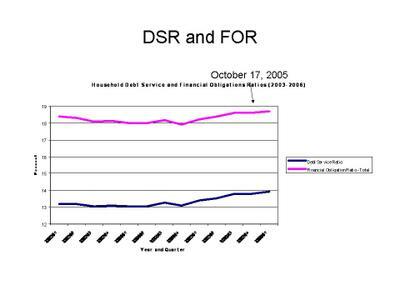 For the two key measures of consumer indebtedness published by the Federal Reserve system, the consumer Financial Obligations Ratio and Debt Service Ratio, October 17, 2005 was a non-event. Consumer debt loads showed no discernible change surrounding the effective date of BAPCPA. Finally, the aggregate amount of consumer debt outstanding continues to grow as well. Indeed, aggregate credit card debt has increased at rates that are higher (or at least as high) as the pre-BAPCPA rates of increase. In short, a behavioral model of consumer lending suggests that tightening up on the bankruptcy discharge will do very little to change ex ante consumer borrowing decisions, and hence it will do little to change either the underlying level of credit card default or the number of families in financial distress. We see little in the above data to contradict this intuition. I am one of those irrational borrowers. I ran up a fair-sized credit card debt, then when it reached a point where the payments were more than I could handle, I drained my retirement accounts to pay down the debt rather than seek bankruptcy protection. Then I was fired from one job, then was fired from another job, lost a car through repossession and was hit by massive medical bills that weren't covered by insurance. Throw in a divorce for good measure, and I finally filed for Chapter 7 protection prior to the change in bankruptcy law. It is from this personal viewpoint that I agree with your conclusion that tightening bankruptcy discharge has no effect on consumer borrowing decisions. Whenever I whipped out that credit card, I wasn't thinking that I could escape my debts by filing for bankruptcy; I was thinking the good times would last and I could have my heart's desire immediately and pay for it at leisure. And then I was paying for groceries with credit, because the month lasted longer than the paycheck, and then I robbed my future to try to rescue the present. 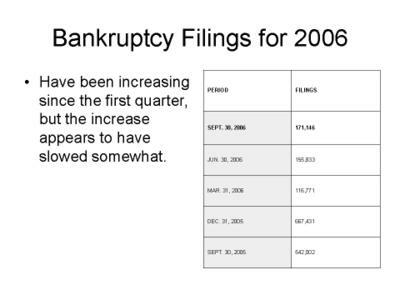 Bankruptcy was something to be avoided, even then. It was only when I saw no way out and the only calls I was getting were from people demanding money that I gave in to the inevitable. Today, I avoid credit. But it isn't because of the changes in bankruptcy law. I just don't want to be caught in this situation, ever again. I am slowly building up retirement funds again, but at age 51, I know I'll be working until I can no longer crawl out of bed. Tougher bankruptcy laws have as much effect on consumer borrowing as capital punishment has on crimes of passion. When emotions rule one's actions, thoughts of consequences don't enter the picture. The happy difference, if you will, is that the stigma of bankruptcy is temporary (until it leaves your credit report); capital punishment, once finally carried out, is forever.